The sun wasn’t quite setting but it was heading toward it. I rode off to a pub in Surfers Paradise, which is how it should be done in my opinion. CanRdly Treadlies have been kind enough to supply me with two State Bicycle Co bikes, the Contender seen above and the Core, a base model bike, seen below. Both bikes are eminently suitable as regular rides, having the essential qualities we need in a bike.That is, providing our dull lives with the kind of quality and sophistication we lack elsewhere. (Sorry I might have been making assumptions about my audience based on my own experiences. What I meant to say was, providing our already boldly glamorous lives yet more quality and sophistication.) But before we talk about the rides let’s take a quick peak at CanRdly Treadlies and how State Bicycle Co bikes ended up here in Australia. There are two ways to enter the fixie market. You can launch your own product, as many fine brands I’ve reviewed have done, or you can launch an existing product. In the case of CanRdly Treadlies they did the latter, based on their experience with the products and people behind that brand. Starting as a consumer and becoming the supplier means CanRdly Treadlies understand both side of the equation, and if they weren’t already convinced that buying a State Bicycle Co bike was going to be a good experience they wouldn’t be in the market. That’s a good start. Launching an existing brand has other benefits, all the intangibles of branding and marketing. Also other more tangible benefits such as quality control and bypassing the shake-down period of parts and supplies. With single speeds/fixies it’s the small things that count and I know that it can be a struggle dealing with suppliers on the other side of the planet, of knowing the quality of the products you’ve ordered or even getting the product you actually ordered. The State Bicycle Co has been around since 2009 so they’ve got plenty of that stuff sorted already (you’d hope). As I said in my teaser on State Bicycle Co last week, I have been mainly riding the Core, due to a puncture on the Contender. I did replace the tube on the Contender late in the week but apparently, despite my advancing years, I’m still lacking the kind of mechanical diligence that would have me check the tyre. And the second tube went flat too. There’s a thorn or some glass or something in that tyre I didn’t check for. Never mind, we’ve had a couple rides together and it’s all been good times. To be honest I preferred the Core over the Contender. I liked both the look and feel of the straight blade forks on the Core over the carbon forks on the Contender. That said, the Contender has better everythings, looks amazing and has shed several kilos over its stablemate. So maybe I didn’t prefer the Core so much as I got friendly with it and found it was all the bike (and more) that I would ever need. Both bikes ride nearly identically, except for the carbon forks, but the Contender has a heap of good gear on it, making it the premium ride. I’m also a big fan of sealed bearings, seen on the Contender, as they fit in perfectly with my (almost nonexistent) maintenance schedules. With my first look at these bikes I was struck by the lovely colours. The photos here won’t do them justice. My wife said of the Core, “That’s the colour I want,” and I was a bit smitten by the Contender (especially because of the black and red livery). There is a depth of colour to both you won’t see here in my pics. The red was like an anodized red and the blue was a slate grey/blue offset by the red hubs. Anyway, enough gawking, let’s ride. First impressions riding the State Bicycle Co Core was of a bike that felt natural and comfortable from the get go. A highlight for me was the seat. I find many saddles are over-padded, or have strange shapes and cut-aways. Often they’re comfortable enough once you get used to them. With this saddle my bum said thanks straight away. This saddle was my favorite of any test bike I’ve had to date. The bikes I’ve got are a 52 (the Contender) and a 55 (the Core). I’m more of a 52 kinda guy but in this case I found the 55 the preferred ride. The 55 had a higher bar which negated the slightly longer reach. The bike felt tight and right straight away but also with the longer wheelbase it gave the bike a tracking feel when cornering. It was the kind of ride where (for instance…because this happened) going downhill and around an off-camber bend I found myself a little too far across my lane (with oncoming vehicles). To quote our former PM’s aspirations for us as a nation, I was “relaxed and comfortable” when leaning the bike further to left (which is where the comparison with our former PM differs) to complete the turn. It is always a good sign when a new bike inspires confidence and helps make the simple things simple. The points of contact were all good on both State Bicycle Co bikes. I’ve mentioned the saddle already. The bars were a choice between the drop bars and the bullhorns. Both are available when you buy online through CanRdly Treadlies. I liked the shape of the bullhorns, especially when pulling away in traffic. They gave good leverage to pull against when getting away from lights. The cyclocross style brake levers worked well on both bikes, giving multiple options for braking. On the drop bars I could drop my hands into a natural position on the curve of the top bar and tweak the sides of the brakes as required. They worked plenty good when used in their natural position too. Pedals were different on both but both from Wellgo. Both options will soon be available on the CanRdly Treadlies website. I like Wellgo pedals, having abused a pair for nearly a decade on my mountain bike. One pedal on my MTB started making a loose bearing kinda noise several years back but survives without any maintenance to this day. Here’s hoping the State Bicycle Co pedals do even half as well. The standard pedals are your usual caged numbers (standard pedals are never very exciting). I preferred the plastic flatties. They worked well with the straps provided. The frames on the State Bicycle Co bikes are 4130 chromoly. I know this because there’s a nice big sticker on the bottom of the down tube telling me so. There’s another sticker on the top bar of the Core. I never bothered to read it but I know it has some kind of warning on it. Probably it says, don’t read this while riding! We love to see a 4130 chromoly sticker on a bike. It’s a sign of quality. But it’s also important to know what it does and doesn’t mean. The 4130 means there’s a mix of metals that conform to the 4130 standards. It doesn’t tell you anything about the quality of those metals used in the 4130 alloy, about the quality of the tubes that were drawn from that metal or anything about the quality of the manufacturing of those tubes into a bicycle. Seeing 4130 on a frame is not the same as seeing (for instance) Reynolds 725 on a frame. But it’s a good sign nonetheless, especially in comparison to the many bikes that lack the equivalent. That said, the Contender would have to be the lightest steel framed fixie I’ve had on review. (You know I never weigh or measure anything so I have no empirical evidence of this. But I’m telling you it was damned light for a steel bike.) A combination of good parts selection, a carbon fork and (I’d have to assume) a quality tube-set, have created a steel framed bike of commendable weight. We often look to aluminium to give us a light bike but we love the ride qualities of good steel. Well with the Contender you can have the best of both worlds. One that note, the ride quality of the steel framed bike is as good as you would expect. It has a liveliness that you expect from good steel, feels taut, and is comfortable over longer rides. The Core is noticeably heavier. The differences between the Core and the Contender are those lovely looking carbon forks and pretty much all the fittings except the brakes. You get sealed bearing all round on the Contender and an upgraded crankset. You get some brands you know and love, like FSA and SRAM. The bottom bracket is splined. Hooray. Having moved beyond square taper bottom brackets so long ago it’s disappointing to have them on all the single speeds and fixies. 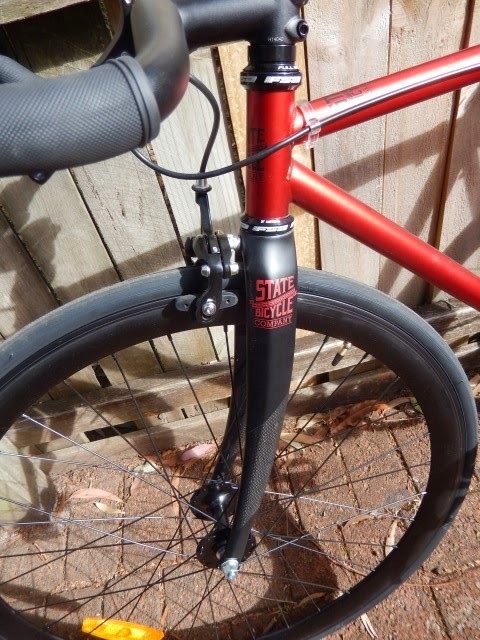 Thankfully State Bicycle Co have the specced a splined bottom bracket on their premium bike. Admittedly a base model unit from SRAM, but these puppies will survive more punishment than square taper units while still feeling tight. It’s a cheap enough upgrade on a new bike so you have to wonder why more brands don’t follow. It’s a (reasonably) expensive upgrade later on (compared with just replacing a bottom bracket) when you find your square tapered jobbies have developed some slop. One small details I liked was the nuts on the wheels. It’s another small detail but one that pleased me. They have those washes that are built into the nuts. So it stays in place when you’re mounting the wheels and doing up the nuts (rather than tearing the paint off the frame like I do with normal washes because I’m a bit careless with stuff). It’s a small thing but I do appreciate it. The other thing they have is some chain tugs with bolts on the back. (See pic below so I don’t have to explain it so clumsily.) There are pros and cons to this style of arrangement (over, say, the little hex key ones that are built into the frame). It maybe matters most when you’re changing tyres on the side of the road. Do you carry a little hex key or 10mm spanner with you? Or an adjustable spanner? Or do you leave enough slack in the chain so you can squeeze it off in a pinch? Or call mum for a lift? 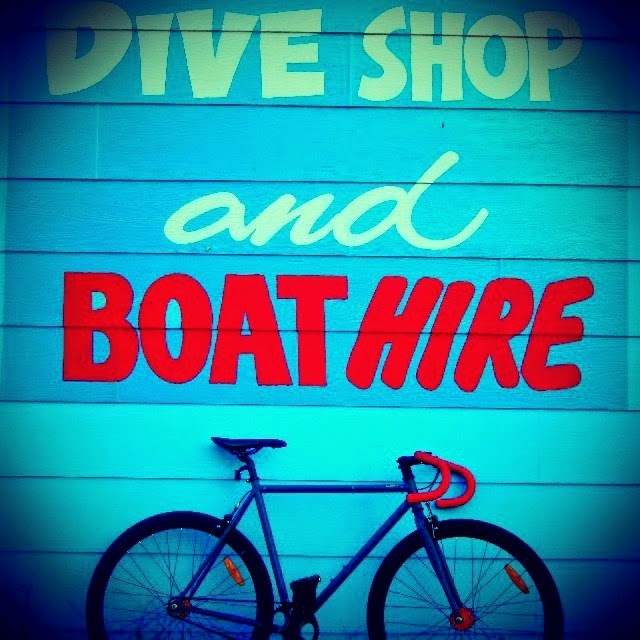 Having State Bicycle Co on the market locally adds to an already vibrant market. Both bikes offer you the kudos of associating with a great brand. Both bikes will turn heads and make your friends jealous. The Contender will even impress them in the lift test with a desirably low weight. Check ’em out with the link below.